The new bike/pedestrian bridge that crosses over the spillway at Alum Creek will officially open at noon on Friday, May 18, with a ribbon-cutting ceremony featuring Orange Township officials, township staff, the park board, the U.S. Army Corps of Engineers, and the Ohio Department of Natural Resources. 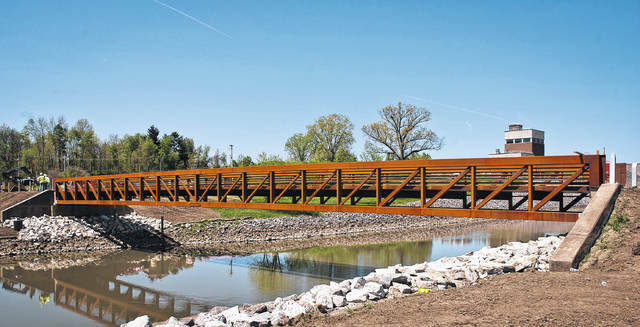 Orange Township is inviting the public to attend the grand opening of the new bike/pedestrian bridge that spans over the spillway at the Alum Creek Below Dam Area, 5905 Lewis Center Road. The event will take place at noon on Friday, May 18. Township officials, staff, the park board, U.S. Army Corps of Engineers, Ohio Department of Natural Resources, and the construction team will participate together in a ribbon-cutting ceremony to officially open the bridge. “It was a nice joint venture between the township, the Army Corp of Engineers and Alum Creek Park,” said Beth Hugh, parks and maintenance director for Orange Township. Hugh said the bridge is part of the township’s 2008 Master Parks Plan, and in 2013, the township began working with Alum Creek State Park to obtain a lease agreement form the U.S. Army Corps of Engineers, who owns the land beneath the dam. Hugh said the township applied for and was awarded in 2015 two grants totaling $450,000 from the Ohio Department of Natural Resources for the Alum Creek Bridge Trail and Bale Kenyon Trail. She said the two trails now connect the Alum Creek trails to the township’s trail system. She also said that Alum Creek State Park gave the township $22,000 for the project from the sale of an easement to Consolidated Electric. The George J. Igel and Company Inc. were awarded a contract by trustees on the recommendation of Hugh for the Alum Creek Bridge Trail construction. Hugh said the bridge was transported from Alabama in two separate pieces, then on a rainy November day, she and others watched the bridge be bolted together and lowered into place. Hugh said the concrete would have cracked and crumbled during transport to the spillway from Alabama, so it was poured once the bridge was in place. However, she said they had to wait until spring when the weather was warm enough to pour concrete. Hugh said the bridge is 12 feet wide so people can fish off of it and there is still plenty of room for others to pass by. She added the connecting trails should bring more people to Alum Creek and the surrounding area. The next project the township will address is phase two of the Lewis Center Trail, which is in the drawing stages now. Hopefully, Hugh said, it will be completed by the end of the year. For additional details on the grand opening, contact the Orange Township at 740-548-5430. This entry was tagged Alum Creek, Army Corp of Engineers, D. Anthony Botkin, Dam Area, Hugh, Orange Township, Sheterom, spillway. Bookmark the permalink.